CHICAGO (FinalCall.com) - When an Ohio judge sentenced Kelley Williams-Bolar to jail for enrolling children in a suburban school district where their grandfather lived sharp words were spoken. “I will make an example out of you,” said the judge. Ms. Williams-Bolar is an example of a courageous Black woman who feared for the safety of her children when her Akron home was burglarized and a mother who wanted her children to have a good education. She shared her story May 10 at Metropolitan Apostolic Church, welcomed by the Rev. Leon Finney, Jr., at a program organized by Phil Jackson and the Black Star Project, a group devoted to making sure Black children are properly educated. Ms. Williams-Bolar, with teenage daughter Jada by her side, brought the audience to tears as she shared the ordeal—and how her father, who paid taxes in the school district—died in prison but was defiant to the end. The daughter and father were accused of fraud and theft. Ms. Williams-Bolar was working with special needs students at a public school, had never been in trouble and was going to school part-time after a divorce. Her home was broken into and Akron schools weren’t good. After a talk with her dad, she agreed to enroll her girls where he lived. She knew it wasn’t uncommon for children to attend schools outside of where they lived. Kelley Williams-Bolar comforts daughter Jada during emotional part of her story. “When I enrolled them I figured, ‘Now they got a chance; they got an opportunity.’ This district for the most part is all-White, my kids excelled in that district even after all that had happened to me,” she said. In the second year, a letter came saying the children were ineligible to attend school in the district but asked her to come in and work things out, Ms. Williams-Bolar said. Getting a grandparent-power-of-attorney document and meeting with school officials did nothing, she said. The district refused to accept the grandparent-power-of-attorney; a court upheld that decision. She withdrew her children. The school district had paid a private detective to follow and investigate her. Some 18 months later, with her children no longer in the district, Ms. Williams-Bolar was indicted for grand theft of services. Accused of stealing $30,000 worth of education, tried and convicted, she was given 10 years in jail. Represented by a lawyer she said did little but take her money, Ms. Williams-Bolar was shaken, scared and stressed out. The judge told her: “I will stop you from graduating from college.” But press coverage of the case had increased. The mother’s sentence was brought down to two years probation, restitution, regular check-ins with a probation officer and holding down a job. “ ‘You did wrong so I am going to give you a felony but I want you to maintain a 40 hour job a week? ’ ” continued Ms. Williams-Bolar, repeating the onerous terms imposed by the judge. She served nine days in jail. She also suffered from post-traumatic stress disorder. Once released, she barely left her room, or spoke to her children, or family members. Daughter Jada said she lost her mother for a year because of PTSD. Jada also felt guilty. She felt responsible for her mother’s woes and was teased by classmates. Perhaps most painful and infuriating is the death of Edward L. Williams. The 65-year-old man died after serving 11 months in prison. He had a month left on his sentence. The father and daughter were tried in 2010. Under heavy pressure, Ohio’s governor pardoned Ms. Williams-Bolar. Her father was not convicted in the education theft case. He was charged later with fraud related to his disability, receipt of social security and state benefits and was convicted. His daughter said her father was targeted—and another example made. Requests for an early release were denied, though Mr. Williams was largely hospitalized while in prison. But, Ms. Williams-Bolar said, her father was strong to the end. “ ‘Do what you are going to do anyway, and I told her what I had to tell you,’ ” Ms. Williams-Bolar said her father told the judge at his sentencing. She was not allowed to visit him in prison because the two had been accused of a conspiracy. When finally given special permission to visit, he was shackled to a bed, she recalled. He lost the ability to walk in prison, recovered but suffered from kidney failure, was incapacitated and passed away, Ms. Williams-Bolar said. Sitting next to her mother, Jada broke down and cried as her grandfather’s suffering was recounted. It was her first time hearing the full story. He passed away May 10, 2012. “Kelley Williams-Bolar can be compared to Rosa Parks, Frederick Douglas, George Washington and other great Americans who stood up to tyranny. They arrested her, tried her, convicted her and jailed her for wanting the best education for her daughters,” said the Black Star Project. Mr. Jackson is calling for a federal law that would prohibit jailing parents for sending children to the wrong school district. 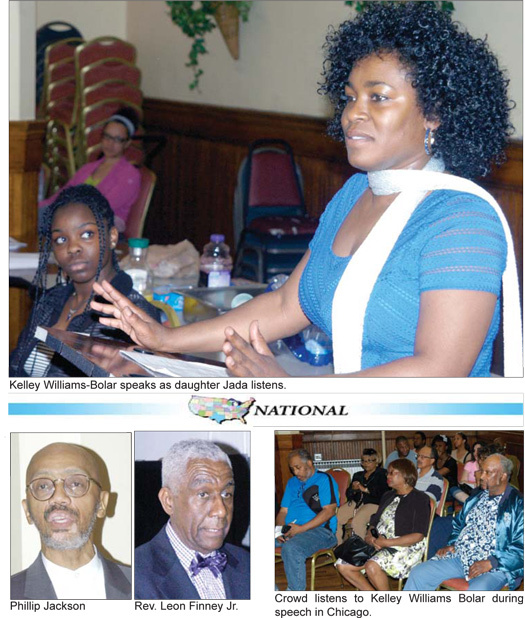 There was also a call for Barack Obama to grant Ms. Williams-Bolar a presidential pardon. Ms. Williams-Bolar’s Chicago visit was sponsored by ABBA Church of Renewed Faith, King of Glory COGIC, Memorial Baptist Church, Metropolitan Apostolic Church, Prologue Schools, Center for the Study of Race, Politics & Culture at University of Chicago and The Black Star Project. “She is a profile in courage,” said Mansong, a musician and activist. Ms. Williams-Bolar is working on a book and there are plans for a movie. She isn’t rich. Her speaking tour is designed to pay for Jada’s education. If money isn’t raised, Jada will be back in public school.